Pictured: The Ravenel Bridge, along with the Grace Memorial and Silas N. Pearman before their destruction. Photo by Vince Streano. Story and Research by Pamela Gabriel. 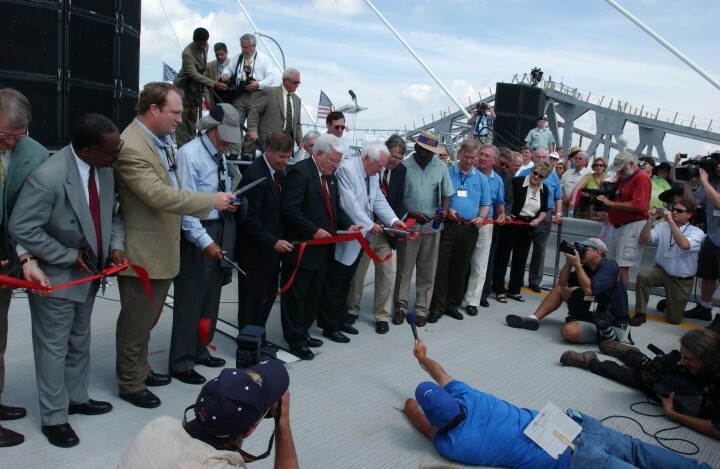 When the Arthur Ravenel Jr. Bridge opened to traffic on July 16, 2005, it followed a weeklong celebration that rivaled the three days of festivities when the first Cooper River Bridge opened in 1929. Pedestrians were permitted to walk the bridge for two days early in the week. A gala was held on the deck of the USS Yorktown. There was a black tie concert. One of the most spectacular events was the bridge lighting ceremony, which took place on July 14. The $250,000 fireworks demonstration featured simultaneous exhibits from each side of the massive towers and a third from between the towers. Other displays were sent skyward from four barges in the Charleston Harbor. One of the most memorable spectacles featured lights cascading down from the bridge decking in a waterfall effect. More than 60,000 fireworks consisting of 20,000 pounds of explosives echoed across the Cooper River and lit up the sky above and reflected in the waters below. The official opening ceremony took place on the roadbed between the two towers on a hot Saturday and featured a long list of state and local dignitaries, including both U.S. Sens. Lindsey Graham and James DeMint and retired U.S. Sen. Ernest “Fritz” Hollings. Following the opening remarks the first cars traveled across the new span. Perhaps no one was more pleased to see the first cars travel across the new bridge than Charleston Mayor Joseph P. Riley. For years, Riley envisioned an eight-lane bridge with a pedestrian and bicycle lane, only to be told it could not be built. He was adamant that the job eventually could be completed. The original Cooper River Bridge opened in 1929 and was renamed the Grace Memorial Bridge in 1943. It was an adventure to navigate its 20-foot-wide roadbed and steep curves, and the bridge was also functionally obsolete and potentially dangerous. The three-lane Silas N. Pearman Bridge opened next to the Grace Bridge in 1966, but increased traffic due to the rapid growth of the area, especially in Mount Pleasant, soon rendered this structure insufficient for daily commuter traffic. There was some nostalgia for the old bridges, but, once the Ravenel ‘graced’ the Cooper River and commuters were no longer faced with daily traffic tie-ups, locals embraced the new bridge. The biggest hazard now associated with the Ravenel is tourists taking pictures of the magnificent structure while speeding across its eight lanes. After 10 years, Joe Riley is still enamored with the Ravenel Bridge. He readily admits that it exceeded his expectations and is “more beautiful, more elegant” than he envisioned. “The scale of the bridge works perfectly in the large expanse of water, not at all overwhelming,” he added. The biggest surprise to the longtime mayor of Charleston is the success of the pedestrian/bicycle lane, which he insisted on during the design stage. “It’s become a destination spot. Day and night, people are walking or biking,” he noted. Despite the increased growth of the area, especially East of the Cooper, Riley does not think the bridge will need to be replaced any time soon. “Eventually the use and availability of public transportation will ease traffic concerns,” he prophesized. The bridge was designed to support a light rail system. Looking back over his 40 years at the helm of Charleston, where does Riley place the completion of the Ravenel Bridge? “Right up there,” he said without hesitation. Pictured: The ribbon cutting for the new bridge. Photo by Rob Thompson SCDOT. Bobby Clair, a Charleston native, was looking forward to retirement after working for more than 30 years for the South Carolina Department of Transportation. He agreed to stay on for two more years to help with the groundwork for the proposed new bridge and then to take over the reins of the entire project as the director of engineering. He was asked to handle the job because he was familiar with the various local and state bureaucracies. He insisted on having the authority to make all major decisions, a necessity because time was certainly a factor on this project. Early on, only half the construction costs were certain, and some aspects of the bridge – the pedestrian/bicycle lane, for example – were in jeopardy if all the funding was not approved. Fortunately, the money became available, and the bridge was completed a year ahead of schedule. It would appear that the most difficult task would be building a new bridge while keeping two existing bridges open to traffic. However, the biggest challenge was constructing a bridge that did not negatively impact adjacent neighborhoods. Generally, roadway construction work is done at night to have the least impact on traffic but, in this case, the vibrations and pounding were disturbing nearby residents. Clair said the toughest aspect of this problem was building “neighborhood trust,” a job handled through outreach programs, training and employment opportunities and public education. Local residents received on-the-job training in fields such as welding and concrete work, obtaining skills that would last long after this project was completed. 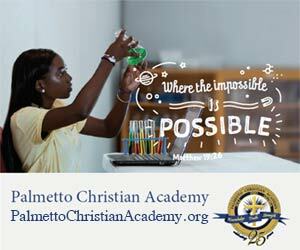 Even local high school students participated in summer training programs. Ten years after the bridge was completed, Clair still hasn’t retired. He is currently working for a design/build firm that is planning a replacement for New York’s Tappan Zee Bridge, which will have 16 vehicle lanes plus a pedestrian/bicycle lane. Pictured: Arthur Ravenel Jr. Photo by Rob Thompson SCDOT. Looking Back • Arthur Ravenel Jr.
Ravenel was involved with the bridge project early on when he ran for the state Senate at the urging of Mount Pleasant Mayor Harry Hallman. He later served on a committee along with Charleston Mayor Joe Riley and others to work out the details for getting the bridge designed and built. The committee crossed political lines but Ravenel said everyone was focused on the same goal – getting the bridge built. The committee studied every aspect of the bridge, including seismic and hurricane testing. “The one thing we didn’t consider was icing (a problem in the winter of 2014) but I doubt we will see that again for a long time,” Ravenel said. The design/built method was selected as the best choice for the bridge, Ravenel pointed out but then added, “There is no provision in state law for this so we may have built the bridge illegally.” Another chuckle. 1929 – The Cooper River Bridge opens and is later renamed the John P. Grace Memorial Bridge. 1966 – The Silas N. Pearman Bridge opens. 1995 – The Grace Bridge rates a four on a bridge inspection – out of 100 possible points. 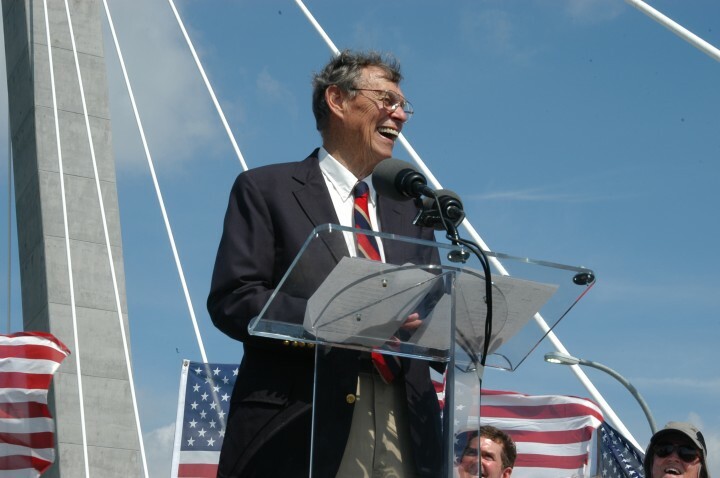 1996 – Arthur Ravenel Jr. is elected to the South Carolina Senate, after campaigning for new bridge. 1997 – The South Carolina Infrastructure Bank Act, spearheaded by Ravenel, is signed to help finance large transportation projects. 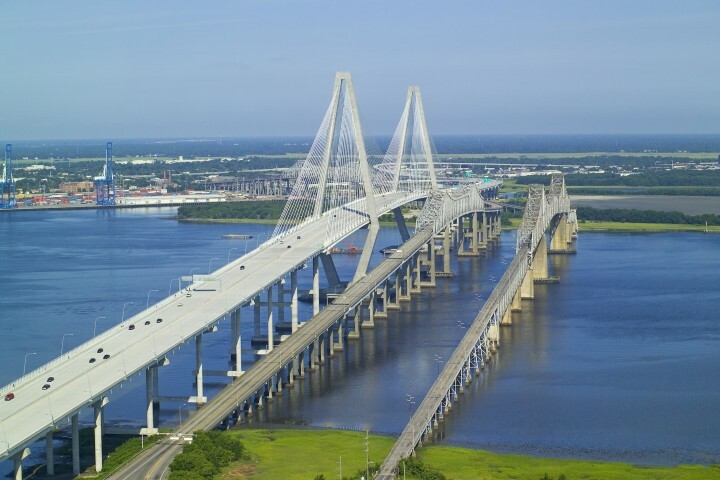 1999 – The South Carolina Highway Commission and General Assembly name what will be the new bridge after Ravenel. 2001 – Ground is broken for the Arthur Ravenel Jr. Bridge. 2002 – Foundations for the bridge towers are in place. 2004 – One hundred twenty eight cables are hung from the towers. 2005 – The last slab is laid in the roadbed. 2005 – The bridge is opened and dedicated on July 16, one year ahead of schedule. Designer: Parsons Brinckerhoff Quade and Douglas of New York City. Architect: MacDonald Architects of San Francisco. Contractor: Built by Palmetto Bridge Constructors, a joint venture of Tidewater Skanska USA and HBG Constructors Inc./Flatiron Structures Company. 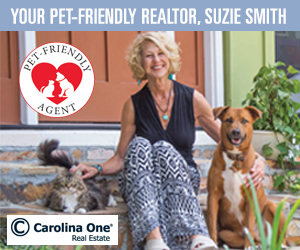 Owner: South Carolina Department of Transportation. Main span: 1,546 feet long – the longest cable stay span in North America. Height: The towers are 572 feet tall – the cable stays measure 560 miles. Clearance: One hundred eighty six feet, with a 1,000-foot channel. Construction: Three-and-a-half years – completed a year ahead of schedule. During peak construction, there were more than 1,000 workers on the project. Materials: Three hundred cubic tons of concrete, 50,000 tons of reinforced steel and 40,000 tons of structural steel. Traffic: Eight lanes of traffic plus a 12 foot shared pedestrian/bicycle lane. Resilience: The bridge can withstand a Category 5 hurricane and a magnitude 7.3 earthquake. Of all the moments the bridge has had over the 10 years, nothing will be more meaningful then the Unity Bridge Chain in honor of the Holy9. We agree! 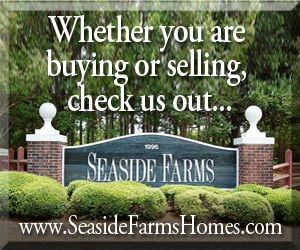 Thanks for reading Mount Pleasant Magazine. I love this picture of the three bridges. Could you post another one showing the “now” view? We don’t have a comparable photo for that comparison, but agree it would be nice to see! Where can I but a picture of this view of the 3 bridges?